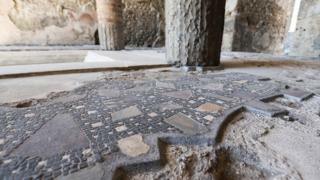 Italian police have detained a British woman suspected of removing some small Roman tiles from a mosaic at Pompeii. Italian media say she was spotted cutting tiles - called tesserae - from a floor mosaic in the world-famous site's House of the Anchor. She was with her father and sister at the time. The damage was estimated at €3,000 (£2,600) by the site's manager. Nearby Mount Vesuvius erupted in 79 AD, killing many Pompeii residents and entombing a thriving city. The 20-year-old woman had crossed a guard rail around the mosaic, police said. Last year police arrested two French tourists found stealing pieces of marble and earthenware at Pompeii, Italy's Il Giornale daily reports. And in 2016 an American took a piece of marble off the floor of the House of the Small Fountain, the paper said.